The Dutch Banking Association (NVB) provided numbers on how much fraud there is in the Netherlands with internet banking (in Dutch). Since we’re doing a project called cidSafe for several companies in the financial sector in the Netherlands on consumer identity (see this recent presentation in English, or the website which is mostly in Dutch), I was very interested in these numbers. 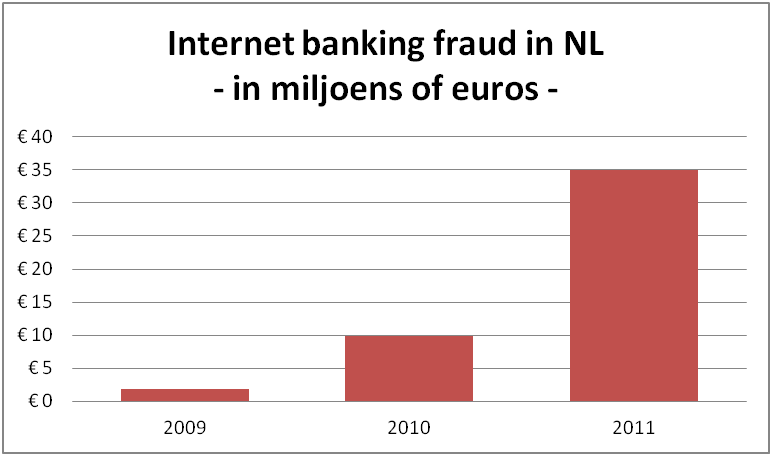 The fraud with internet banking in NL is €4.3M for the first 6 months. Although I agree with the NVB that this in itself is not a huge number, the increase is very big. In the whole of 2009 the fraud was €1.9M, thus an increase of about 450%! By the way, victims of internet banking fraud are usually reimbursed by their banks, and all Dutch banks use two-factor authentication. Compared to the numbers recently released in Germany, internet banking fraud seems a somewhat bigger problem in the Netherlands than in Germany (with an estimate of €17M in 2010 about twice as much fraud as NL, but with 5 times more inhabitants). Also in Germany there is a big increase in internet banking fraud compared to 2009. The NVB press release mentions phishing as the main method of fraud. I couldn’t find more details on this, but simple phishing of username/password won’t work since all internet banking services in NL use some form of two-factor authentication (smartcard or SMS one-time-password based). Malware attacks are becoming more advanced, as e.g. the recent “Zeus In The MObile” malware showed that can even spread from desktop to mobile using social engineering. This article (sorry, again in Dutch) states that most attacks are a combination of relatively simple phishing or malware (keylogggers) with social engineering to get the second factor. invest in technology, by providing more secure authentication means that are (not or) less sensitive to malware and social engineering attacks, which is very expensive and can be very annoying for users. The alternative for banks is to wait and see if others (police, government, operation system vendors, anti-malware vendors etc) will be able to counter this increase in internet banking fraud, this is however not what I expect they will do, as is also shown by the new awareness campaign by NVB. I’m at the ISSE 2010 this week, which takes places in Berlin this year. I’ll share my impressions on two subjects that were hot (in the first two days, since I write this with one more day to go). The ‘hottest’ item is the new German eID card (nPA), which will be issued starting 1 November. 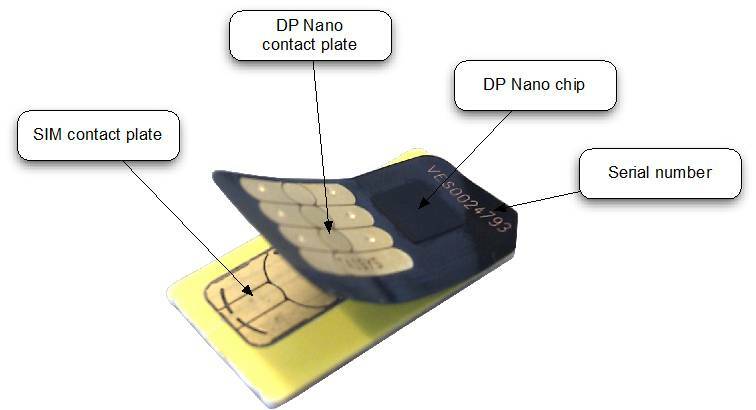 This is a ‘normal’ ID card, with an eID contactless chip. Technically the eID function seems to be better than what I’ve seen before, but more interesting for me was the business model behind it, and how they handle privacy. With respect to the digital signature function, this is not present by default. A citizen has to go to a commercial party for this, i.e., a different business model for the signature function as for the authentication function. Reason seems to be that this is not considered a government responsibility (contrary to authentication/identification), and companies are already offering this as a service (I expect not a lot to consumers though). This probably also means that there will be only very few people that go to this trouble (and costs), and thus little coverage for consumers/citizens. With respect to privacy: what is interesting is the ability to be a pseudonym-only authentication device, that relying parties need to register and motivate which attributes they want to read, user consent and proof-of-age function that does not reveals ones age. Also interesting is that kids below 16 are not allowed to use it to identify themselves, for privacy reasons I assume (can’t trust those kids to know what they’re doing J). The big question is now if this takes off with both public and relying parties, and how long this takes. There are examples in other countries that were earlier, where this went very slowly of not at all (e.g., Belgium). There were some, mostly German, talks on phishing and malware. Quite scary actually how this is progressing. Cybercrime seems to become more professional, and is scaling up. I’m a strong believer in “good enough” security, especially when it concerns damage that is ‘only’ money/fraud, contrary to privacy loss. To quote a number, the German government (Bundeskriminalamt) estimates a €17 million fraud for phishing/malware in Germany for online banking for 2010 (with €3500 average damage). This in itself is not a number that surprises me, it is even lower than I expected, but if the growing trend (71% up from last year!) continues the coming years this number will increase quickly. Of course, costs to properly counter these threats, and the userunfriendlyness that often comes with it, are also huge.